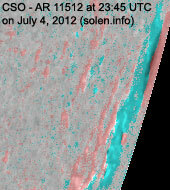 Last major update issued on July 5, 2012 at 05:20 UTC. 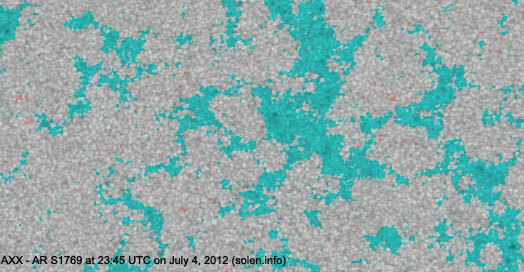 The geomagnetic field was quiet to unsettled on July 4. 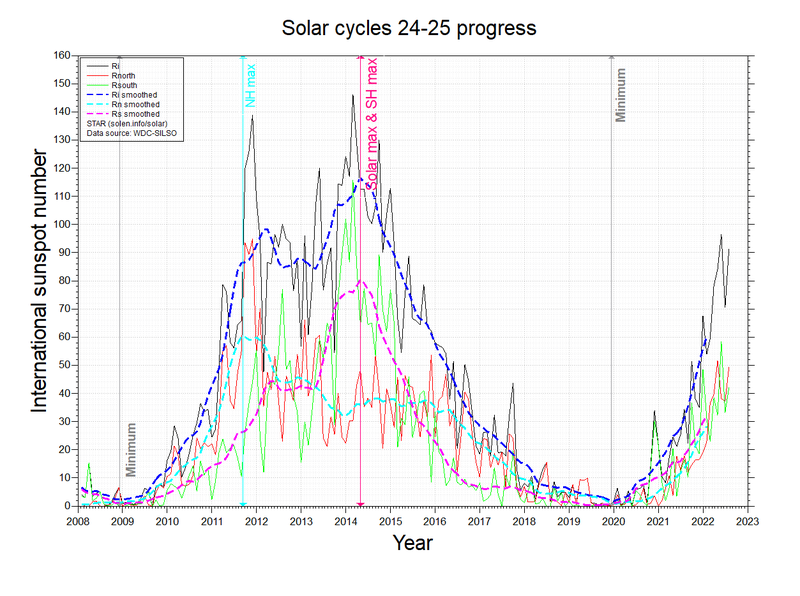 Solar wind speed at SOHO ranged between 449 and 585 km/s under the decreasing influence of a high speed stream from CH521. 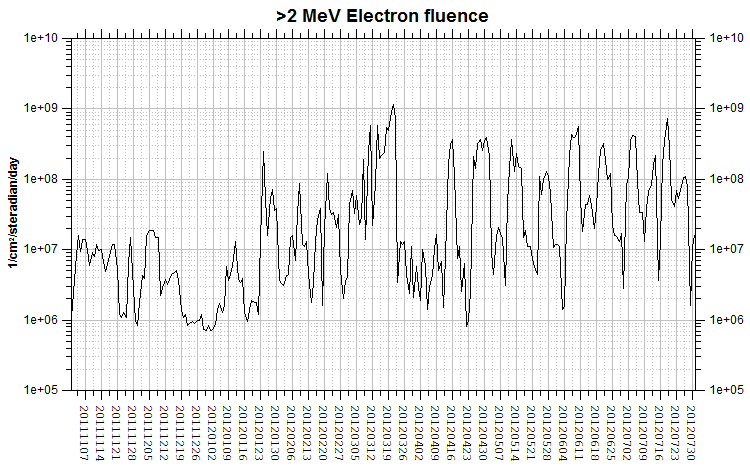 Solar flux measured at 17h UTC on 2.8 GHz was 149.2 (increasing 21.0 over the last solar rotation, the measurement at 20h UTC was flare enhanced). 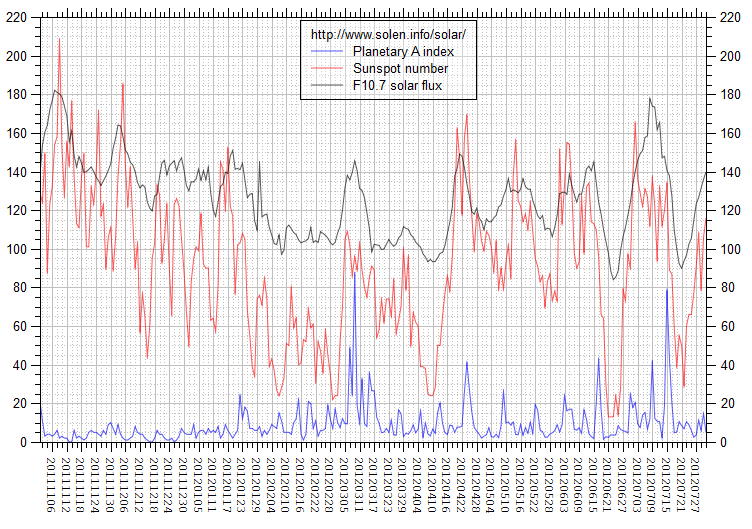 The Potsdam WDC planetary A index was 12 (STAR Ap - based on the mean of three hour interval ap indices: 11.6). 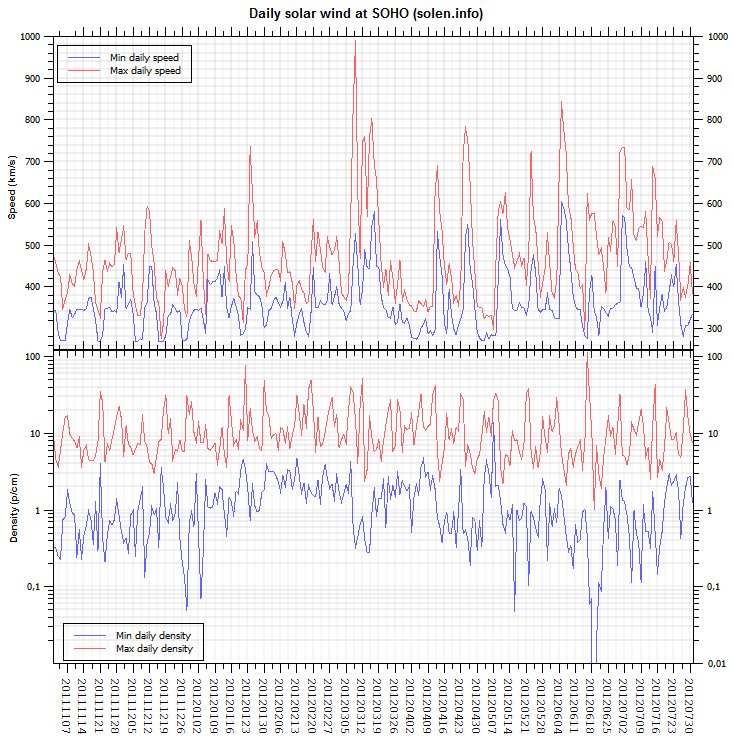 Three hour interval K indices: 33332113 (planetary), 33332312 (Boulder). 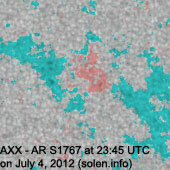 The background x-ray flux is at the class C5 level. 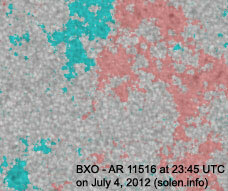 Region 11512 [S15W84] added trailing spots and was quiet. 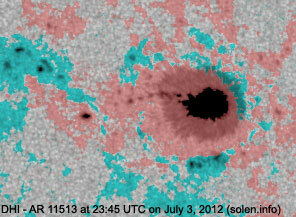 Region 11513 [N15W37] decayed slowly and remains capable of producing C and M class flares. 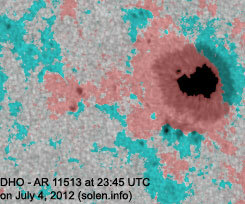 Flare: M1.8/2N at 16:39 UTC. 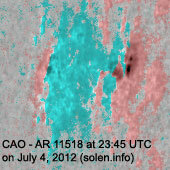 This event was associated with a very weak type II radio sweep and a small CME. 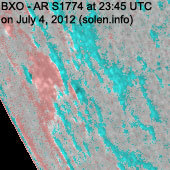 The CME was observed off the east limb in STEREO-A and west limb in STEREO-B and could reach Earth on July 7. 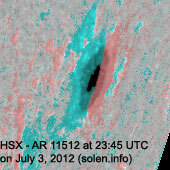 The CME was not easily observed in LASCO imagery. Region 11514 [S16W36] decayed slowly and quietly. 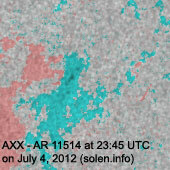 Region 11515 [S18W25] displayed impressive development in the central spot section. 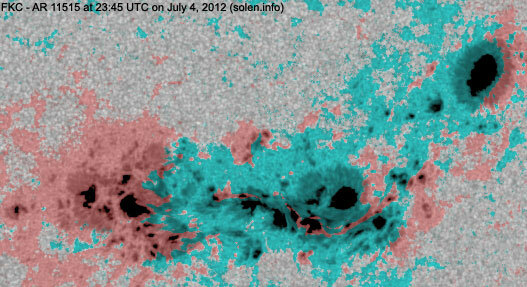 Several magnetic delta structures are evident as negative polarity spots are trapped inside positive polarity flux. 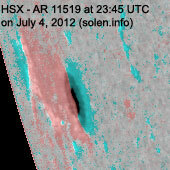 This has caused a significant increase in the background x-ray level. 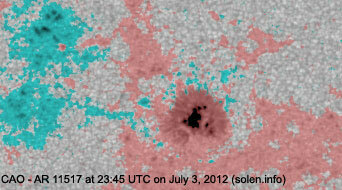 There's a high probability of major M or X class flares. 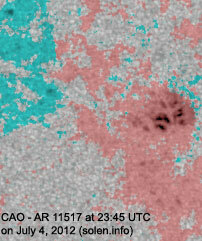 Flares: C5.1/1F at 01:45, C6.1 at 04:10, M2.3 at 04:37, C6.7 at 09:06, major M5.3/2B at 09:55, C5.8 at 11:17, C5.6 at 14:13, M1.3/1F at 14:40, C8.2 at 14:49, C6.4 at 15:50, C6.9 at 16:12, C9.5 at 21:27, M4.6 at 22:09, C7.4 at 22:45, M1.2 at 23:55 UTC. Region 11516 [N12W53] decayed slowly and quetly. Region 11517 [N19W13] decayed slowly and quietly. 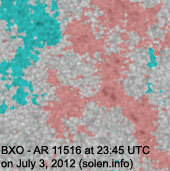 New region 11518 [N09E68] rotated into view on July 3 and was numbered by SWPC the next day. 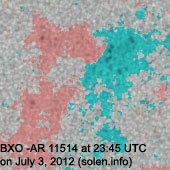 New region 11519 [S15E76] rotated into view with a single spot. 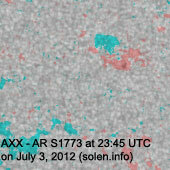 S1767 [N20W24] was quiet and stable. 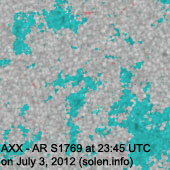 S1769 [N16E03] was quiet and stable. 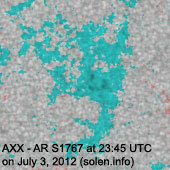 New region S1774 [S25E73] rotated into view with two small spots. 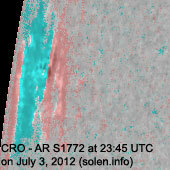 July 2-3: No obviously Earth directed CMEs were observed in LASCO and STEREO imagery. 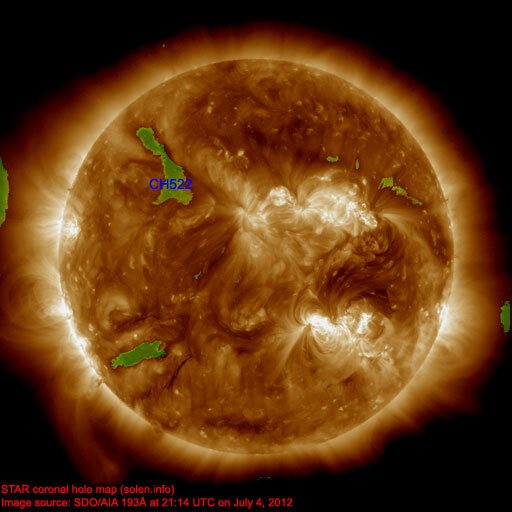 A coronal hole (CH522] in the northern hemisphere could rotate into an Earth facing position on July 6. 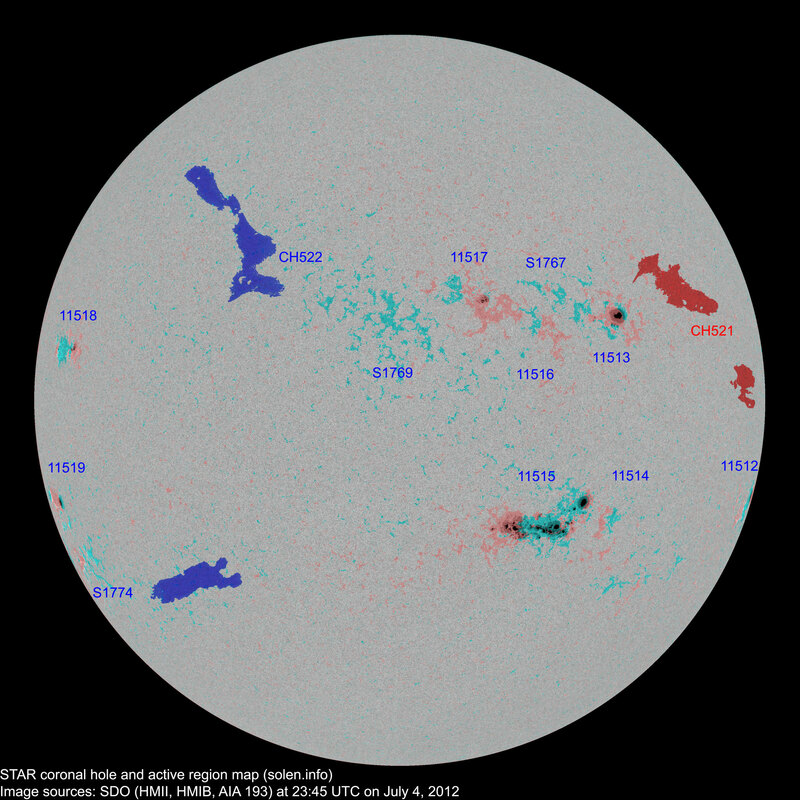 The geomagnetic field is expected to be quiet to unsettled on July 5-7 with a chance of active intervals on July 7 if the CME observed on July 4 reaches Earth.